I think this is probably my 5th post about the Millefoglie scarf. You guys are probably getting tired of me talking about one silly scarf. But this is the TUTORIAL for making the scarf! Now, after gathering all your materials, it’s time to start knitting! 1. 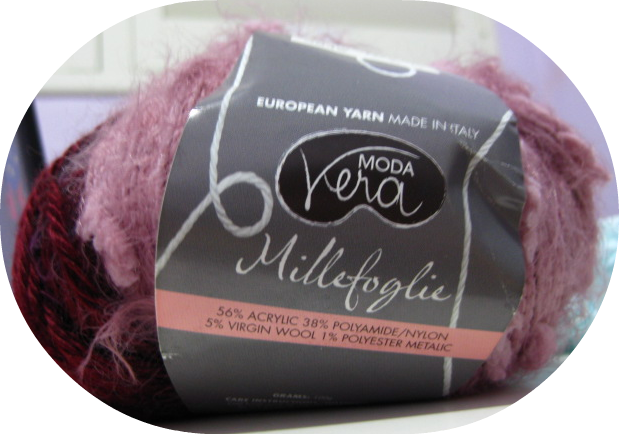 If you are using the Millefoglie yarn, you will have to unwind the yarn to the part where the plain yarn is. There will be a knot between the furry yarn and the plain yarn. Undo the knot! 2. Prepare a short length of sewing thread and a bead. Loop the sewing thread around the yarn. Thread a bead (or 2 if you are impatient) through the sewing thread. 3. Then while holding the sewing thread firmly with one hand, hold on to the bead and pull with the other hand! 4. Your yarn has a bead in it now! Continue to thread your beads through. I used 56 beads in total for my scarf but you may use more depending on the length of the plain yarn that you want to have for your scarf. No harm adding more beads to the yarn because you can just remove the excess as you knit along. 5. Now space the beads equally throughout the entire length of the plain yarn. It’s much easier for you to reach for the bead as you knit along. Re-join the plain yarn (now with the newly added pearls) back to the furry yarn with the same knot that you undid before you added the pearls. Wind the yarn back into a ball. 6. Start knitting from the beginning!!! 3. Sometimes the bead will get stuck in a stitch. Just push it through the stitch so that is positioned in the dropped stitch. 4. Repeat until the scarf reaches desired length. Remember to change your yarn when necessary/desired if you are not using the Millefoglie yarn. 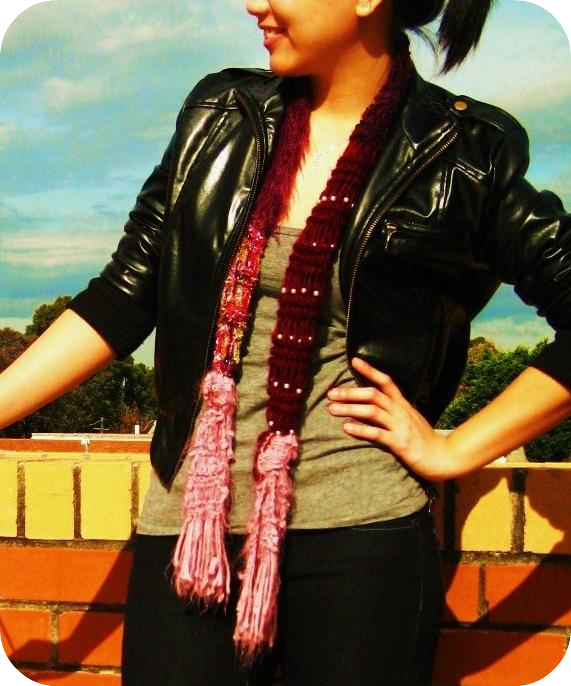 My scarf measures about 60.5 inches length when the knots are untied and excluding the fringe. 5. End with 3 rows of knit. 6. Cut several pieces of the light pink yarn for the fringe. I used around 12cm for each piece. help of a crochet hook. 8. Continue until desired look is achieved for both ends of the scarf. 9. Tie a knot near each end of the scarf. 10. Show your scarf to the world! I hope that my instructions and pictures are clear enough for you to follow through. Do feel free to comment below or to ask me any questions! Thank you for the pattern :) I might try this once I get some other yarn/beads. I can't wait to try this pattern out. I saw your post on Totally Tutorials and am your newest follower now!